The Chimes Tower at Longwood. Many people assume that renowned businessmen focus almost exclusively on one thing -- the success of their business. Yet some of our nation’s great industrialists have aggressively pursued hobbies, such as the preservation of scenery near Kennett Square. After the turn of the 20th century, Pierre du Pont purchased a local farm to save an old grove of trees for posterity, reflecting a passion for horticulture which evolved into one of our nation’s most beloved floral sanctuaries. bringing in included trees from North America, Europe and Asia. With wild tulip trees, cucumber magnolias, Kentucky coffee trees and hundreds of other varieties acquired in their travels, and from nurseries around the country, the two men nurtured a collection which became known to visitors. When the farm later passed to George Washington Peirce, the acreage was maintained and amenities like croquet courts, summer houses and a rowing pond were added. Despite his dedication, George’s heirs demonstrated little interest in maintaining the property, and they sold it. The acreage was later resold twice, and the third buyer had plans to cut down all the trees to produce lumber for his sawmill. The possibility of losing this natural treasure caused 36-year-old Pierre du Pont to buy Peirce’s Woods, along with additional nearby land totaling 202 acres. He spent roughly $16,000 in 1906 to preserve it forever. This treasure became Longwood Gardens -- the name change from Peirce’s Woods coming from its proximity to the Longwood Friends Meetinghouse. 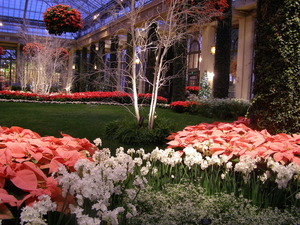 Du Pont's worldwide travels generated the idea to develop this horticultural gem. Stops at dozens of chateaus in France and several Italian villas gave him different concepts for architectural design and development. He actually had hands-on experience with plants -- he’d owned a commercial florist business with seven greenhouses by the age of 28. He also knew a bit about landscaping and design, supervising the building of 150 houses and later heading up the team that built the Du Pont building in downtown Wilmington. and gazebos amidst a huge assortment of plants, trees and shrubs, unequaled in the western hemisphere. His initial project was laying out the property’s first true flower garden, a 600-foot-long Garden Walk filled annuals, biennials and perennials. A 20-foot-wide pool, with the first fountain, was built at the intersection of the main paths. Utilizing his experiences at the Villa d’Este outside Rome and the Villa Gori in Siena, du Pont built the Open Air Theatre and later hosted an elaborate garden party in 1914 that was a huge success. 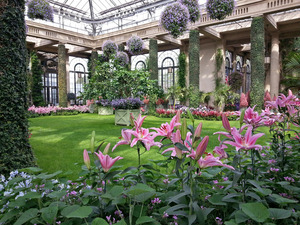 He also had the Longwood greenhouse built to grow vegetables, fruits and flowers. This was later greatly expanded into an enormous building that is 181 feet wide and 204 feet long, with arched windows. Alongside were single-story structures connected to pavilions with their own heat, water and power supplied on site. Visitors could see a huge assortment of locally grown fruits -- apricots, peaches, figs, grapes, melons, pineapples and nectarines. There were even experimental plantings, which included coffee, pomegranates and coconut palms, that were maintained by eight full-time gardeners. Over the ensuing years, du Pont wanted to entertain the public even more, so he had a concert hall and dozens of fountains constructed nearby. The concert hall and ballroom were perfect for his pipe organ, which has 10,010 pipes. Later, an Italian water garden and an expansion of the Open Air Theatre continued his dream of building a world-class complex which people could enjoy for decades to come. 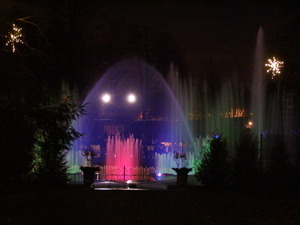 Subsequent improvements included hundreds of additional pools and fountains, accompanied by ornate sculptures imported from Italy, as well as an intricate lighting system with glass filters which allowed the fountain displays to take on a surreal look at night. Years later, these would be accompanied by music, creating a spectacular synchronized panorama. He was more than a visionary horticulturalist. He was also a major history buff, collecting and translating hundreds of family documents from French to English, and compiling a family genealogy going back almost five centuries. 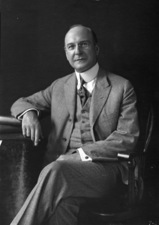 In 1950, he hosted a 150th anniversary celebration to commemorate his family’s arrival in the U.S., with a gala event that drew 632 family members and guests from around the world. On April 2, 1954, du Pont was recognized by the French government for his lifetime achievement and awarded the Cravate de Commandeur of the French Legion of Honor in a ceremony at Longwood. A few days later, he passed away, but his accomplishments will last forever -- a testament to brilliant foresight, unending dedication and a love of nature which has benefited mankind. Gene Pisasale is an author and lecturer based in Kennett Square. He’s written eight books and conducts a lecture series focusing on topics related to the Philadelphia/Mid-Atlantic region. His books are available on www.Amazon.com. For more information, visit www.GenePisasale.com or e-mail Gene@GenePisasale.com.